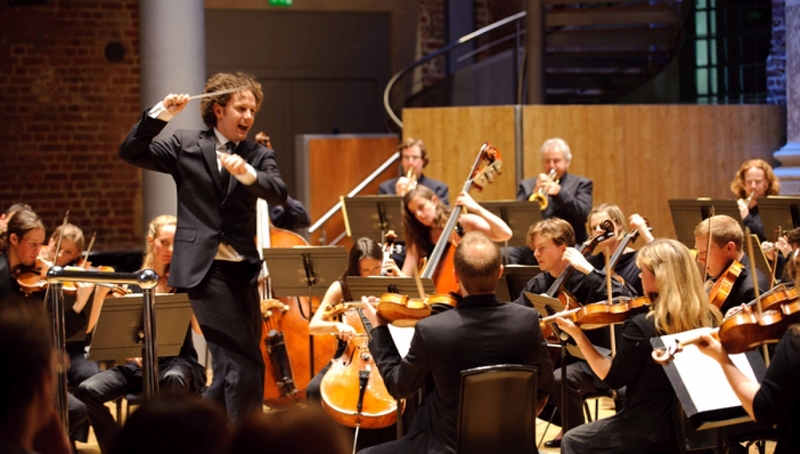 Aurora Orchestra and its conductor Nicholas Collon present Love Song for the City, a characteristically eclectic programme charting a course from violence and destruction to rebirth and the vibrancy of urban life. The desolate post-war German cities of Strauss’ Metamorphosen give way to the dizzying growth of modern New York as imagined by Michael Gordon in Gotham, Bill Morrison’s breathtaking black-and-white film enriching a visceral contemporary classic. The programme is completed by the Symphonic Dances from Bernstein’s West Side Story in a virtuosic new chamber arrangement evoking the flavour of the original West End pit-band instrumentation. Founded in 2005, Aurora Orchestra has been hailed as ‘Britain’s brightest young ensemble’ (The Times) and is going from strength to strength, winning the RPS Ensemble Award earlier this year. Reverb is a five-day festival of contemporary classical, celebrating the best in a new wave of performers who have broken out of ‘traditional’ classical concerts, redefined the rules and shattered boundaries. We want to challenge your expectations and make this music accessible, so expect a laid back atmosphere where you can bring your drink in, unpretentious explanations of the music direct from the performers, move around as you please, and enjoy exciting and innovative performances of some incredible music. Latecomers will only be admitted at the first interval.